On the Santa Monica Pier, at approximately the surf line, a sign post is placed declaring that spot as the western terminus of Route 66. 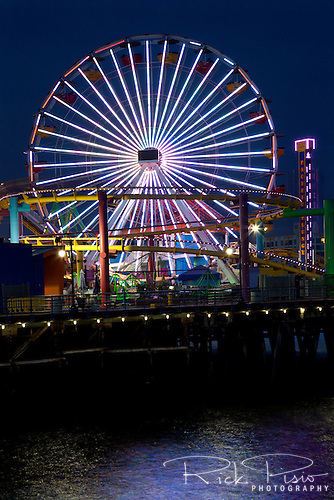 For its entire existence as a numbered US Route the Santa Monica Pier was never the western end of the road. The closest Route 66 ever got to the ocean was 4 blocks east of the pier. 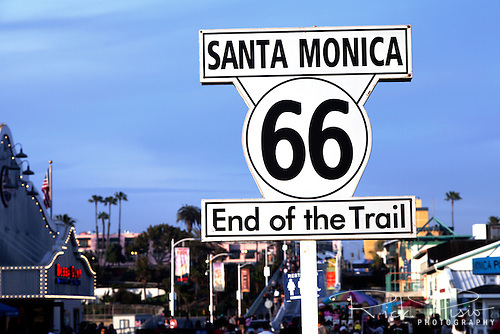 It was until November 11, 2009 that the Route 66 Alliance designated the Santa Monica Pier as the official Western Terminus of Route 66. Is it right, wrong, or does it really matter where they put the sign? 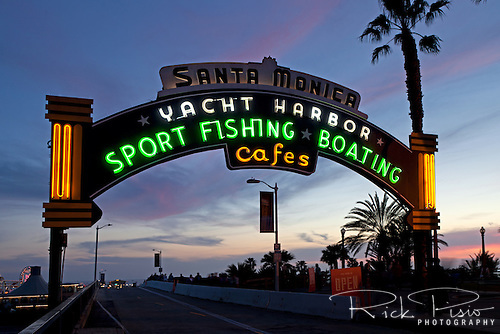 Entrance to the Santa Monica Pier after sunset. I love it!! You are quite the sleuth! If those of us in Washington can claim that the "northern branch" of the Oregon Trail ended in Puyallup, 150 miles from where everyone thought it ended, I guess Santa Monica can claim US66 ends on the pier. I am not going to tell the folks who sponsor "Oregon Trail Days" or who put up monuments proclaiming the Cowlitz Trail to be the Oregon Trail, that they are wrong. If they believe it is the Oregon Trail, then it must be, evidence and reason aside. I think it would be more fun if they sank a post out about 100 yards from the end of the pier and put up a big sign that declared Route 66 to end there! I can see all sorts of promotional opportunities. Maybe just the rear end of an old Corvette sticking out of the water! Right or wrong......Can you imagine all the kiddies who would be disappointed if we said Santa Claus doesn't exist...and we all know he does, I bet he visits the pier every year. I would go just to see him at the end of Route 66! PS....Great photos, as usual.....now I want a Ferris wheel ride! Placing a marker for the western end of 66 at a location that was never the end of the road is not without precedence in Santa Monica. The plaque dedicating Route 66 as the Will Rogers Highway is located on Ocean Ave, which is along the shoreline, 2 blocks north of the Santa Monica Pier at the corner of Ocean Ave and Santa Monica Blvd. There were a couple of endpoints for Route 66 during its existence. In 1936 the road was extended from downtown Los Angeles to Santa Monica ending at what is now the corner of Olympic Blvd and Lincoln Blvd. When I drove through the intersection I didn't see anything commemorating that fact. Given all that I tend to agree with you Dave that it really doesn't matter. The fact that Santa Monica is taking note that the road ended somewhere within their city is good enough for me and ending at the ocean has a romantic ring to it. Besides, the intersection of Olympic and Lincoln is far too congested to set up a gift shop for tourists to purchase their Route 66 coffee mugs and keychains. I do like the idea of a Corvette off the end of the pier but I would mount it on a piling so it looked like it was just about to enter the water. The fact that Santa Monica is taking note that the road ended somewhere within their city is good enough for me and ending at the ocean has a romantic ring to it.